Luxury Condo with Wrap Around Balcony at Tristan Towers on Pensacola beach Florida FL. Unit 12A is a luxury condo with a wrap-around 500 square foot balcony. The condo is a 3 bedroom unit converted to 2 bedrooms. The Condo is located in Tristan Towers on the 12th floor directly on Pensacola Sound. The condo looks South, West, and North providing panoramic views of Pensacola Beach, Fort Pickens, and Pensacola. Fully remodeled with stainless steel appliances, new batrooms, and tile throughout. 55" flat screen TV in Living Room and 50" flat screen TV in the Master Bedroom. All kitchenwares needed to cook local seafood and mix your favorite drinks. 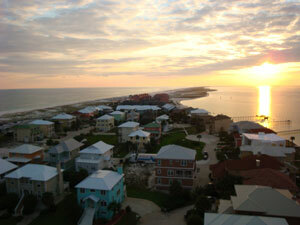 Enjoy sunsets and sunrises over Pensacola Sound or Gulf from your private balcony. Watch barges, shrimp boats, sail boats, dolphins, pelicans, parasails, and banner planes. See the charter fishing boats leave for the gulf at sunrise every morning. See the Blue Angels practice over Pensacola Naval Air Station. Watch the Coast Guard practice ocean rescues in the Sound. Star gaze in the evening and see the Pensacola Light House at Navy Point. A $300.00 Security Deposit is required to confirm your reservartion. Security deposit is returned upon final inspection. A $100.00 non-refundable cleaning fee is also added to the rate.